Seeing among the top three positions in a Google search is worth real money. In fact, 63% of the time one or more of those three firms get a phone call or a visit when people see the firm in a search. But there are only three spots. What can you do to have a better chance to get into one of the top positions? 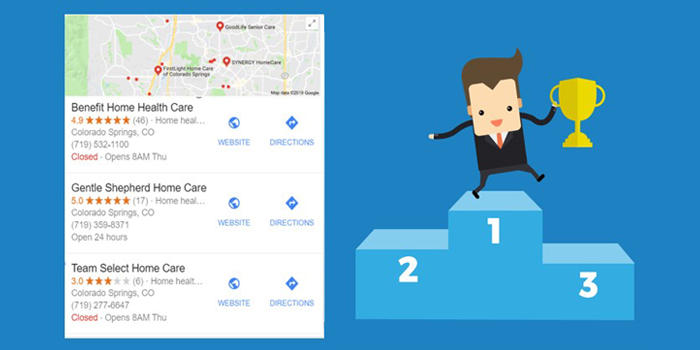 First, make sure your Google My Business profile is claimed, up to date, provides all of the information possible, includes a business description (refer to my letter last week about that) and is optimized with images and videos. Second, make sure your listings throughout the web are claimed and absolutely consistent with your Google listing. To check your status on this subject, use the free tool at http://bit.ly/checkmysites2019. Third, consistently collect positive reviews from clients, client families, referral sources and employees. Rowan Reputation Resources has an easy-to-use tool that allows you to collect Google reviews face-to-face on the spot. To hear more about that send a message using http://bit.ly/rowan-contact. Fourth, accumulate locally relevant links by being involved with visible local organizations (e.g. Chamber of Commerce) who will link back to your website. Another way is to sponsor local events that require people to link back to your website for more information. Finally, build a strong social media presence to establish yourself as a local business with loyal followers. Rowan Reputation Resources also has a program that can provide you with daily, home-care-related Social Media posts to which you can add your own with advance scheduling out for a month or more. To learn more about that, use the same form at http://bit.ly/rowan-contact. Showing up in the top three positions of Google will build your census less expensively and more assuredly than any advertising you can buy.